Almost nothing can impact your business productivity — and your bottom line — more than the performance and reliability of your Information Technology Infrastructure. At Layer 8, it is our goal to make your IT investment effective, reliable and efficient. With properly designed and deployed servers, workstations and edge infrastructure – your users can concentrate on the tasks of running the business, not fighting with an inefficient IT system. 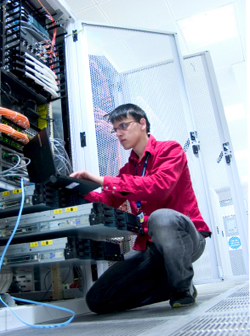 Along with our certified Technicians and Engineers, we have dedicated IT Security professionals. Layer 8 deters unauthorized users from accessing your private data. We help provide secure access to your network, allowing remote employees to share files and information. We help reduce the threat of viruses, worms, and other malicious code on your network, workstations, and servers. Let Layer 8's ITMS team utilize the right blend of on-site and off-site technology solutions to help gain business efficiencies. To ensure the most cost-effective, reliable IT infrastructure for your business, Layer 8 utilizes HP servers, HP workstations and notebooks, Cisco firewalls, Barracuda security, spam and archive appliances, as well as best-of- class software, peripherals and related equipment.